Nomination, sustaining and late payments for a number of regional Bank of America Challenge races are due April 15. AMARILLO, TX—APRIL 15, 2019—Sustaining and late-payments for several Bank of America Challenge regional races are due today (April 15), April 15. Challenge enrolled horses 3-year-olds & up are eligible to nominate for the Bank of America Championship Challenge regionals. Trials and finals will be contested at 440 yards. Challenge enrolled 3-year-olds are eligible to nominate for the Adequan Derby Challenge regionals. Trials and finals will be contested at 400 yards. Challenge enrolled horses 3-year-olds & up are eligible to nominate for the AQHA Distance Challenge regionals. Trials and finals will be contested over 870 yards. Challenge enrolled horses 3-year-olds & up are eligible to nominate for the ARC Distaff Challenge regionals. Trials and finals will be contested over 400 yards. Challenge enrolled 2-year-olds are eligible to nominate for the John Deere Juvenile Challenge regionals. Trials and finals will be contested over 350 yards. CLICK HERE to download a Regional Race Nomination/Sustaining Form. For the current 2019 Bank of America Challenge Tentative Regional Schedule CLICK HERE or for the 2019 Challenge Rules and Condition Book CLICK HERE. For 2019 Bank of American Challenge information or questions call Malynda Reed at 877-222-7223 or email to mreed@aqha.org. 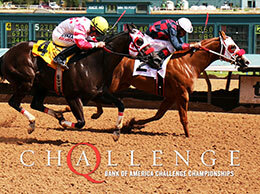 Horses may always be enrolled in the Bank of America Racing Challenge, fees are based on the age of the horse. CLICK HERE for an enrollment form and fee list. For additional information visit the AQHA website at aqha.com/racing and click Bank of America Racing Challenge in the left hand column.